The first 1961 draft of the Soyuz project was used a modernisation of the Vostok 3KA series (Vostok-Zh). 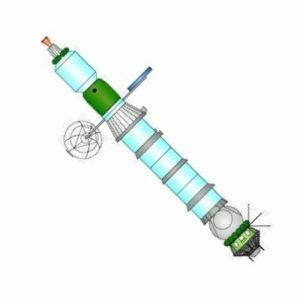 Three rocket stages would be assembled in low earth orbit using a manned Vostok tug. They would then launch a Soyuz capsule on a lunar flyby and return to earth. Russian manned lunar flyby spacecraft. Study 1962. Early design that would lead to Soyuz. A Vostok-Zh manned tug would assemble rocket stages in orbit. It would then return, and a Soyuz L1 would dock with the rocket stack and be propelled toward the moon. Status: Study 1962. Gross mass: 16,500 kg (36,300 lb). The highest Soviet priority after the N1 large booster was a reliable spacecraft that allowed the crew to make re-entries at hyperbolic speeds - when returning from expeditions from earth orbit, the moon, or Mars. On 10 March 1962 Korolev approved the technical project "Complex docking of spacecraft in earth orbit - Soyuz". The Soyuz would first be tested using multiple launches of an R-7 derived rocket. In this concept a large spacecraft was assembled in earth orbit by a Vostok-Zh (or Vostok-7) maneuverable manned satellite, piloted by a 'cosmonaut assemblyman'. The pilot would rendezvous and dock with each component as it reached orbit, then maneuver the component to the in-assembly spacecraft. Following completion of assembly, the Vostok would retrofire and the assemblyman would return to earth. The assembled circumlunar craft consisted of three rocket blocks (RB) and the L1 Soyuz spacecraft itself. The rocket blocks would fire in sequence to put the L1, with a crew of one to three, on a circumlunar trajectory. The original L1 had both main and back-up engines. It consisted of the ZhO living section, the SA re-entry capsule, AO aggregate (equipment/propulsion) section, followed by the three rocket blocks. The Vostok-Zh could be used on another mission to assemble a 15 metric ton orbital station with the mission of observing the earth. It would consist of three separately-launched blocks: a ZhO living section, BAA scientific apparatus block, and the Soyuz spacecraft itself. This closely resembled Sever, another contemporary study project at OKB-1. Family: Lunar Flyby, Manned Circumlunar, Moon. Country: Russia. Launch Vehicles: R-7. Agency: Korolev bureau. Bibliography: 191. 1962 March 10 - . Soyuz Technical Project approved. - . Nation: Russia. Related Persons: Korolev. Spacecraft: L1-1962, OS-1962, Vostok-Zh. Korolev approved the technical project 'Complex docking of spacecraft in earth orbit - Soyuz'. The Soyuz would first be tested using multiple launches of an R-7 derived rocket. In this concept a large spacecraft was assembled in earth orbit by a Vostok-Zh (or Vostok-7) manoeuvrable manned satellite, piloted by a 'cosmonaut assemblyman'. Following completion of assembly, the Vostok would return to earth. The assembled circumlunar craft would put the L1, with a crew of one to three, on a circumlunar trajectory. The Vostok-Zh could be used on another mission to assemble a 15 tonne OS orbital station with the mission of observing the earth.